Our fabulous cake will look something like this (design by Sarah Magid). It will be lemon cake, with lemon preserves filling, and lemon buttercream frosting... my favorite! Finding a baker who didn't use shortening (trans-fat) was really important to us, and Torte Bella uses all natural ingredients (no trans-fat or other junk! ), and as much organic as possible. The sample at our tasting was so incredibly delicious too! I want some again every time I think about it! Yum! So... we need more cake! I decided that instead of just adding more wedding cake, I would get something in a different flavor (3 flavors, actually) and also make it a surprise groom's cake (well, cupcakes) for David. In comes Katie with Hill Country Cupcake! 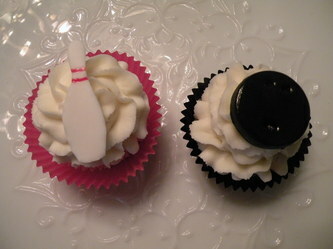 I met her at the bridal extravaganza, and her cupcakes are AMAZING! They're made with organic ingredients too. LOVE. 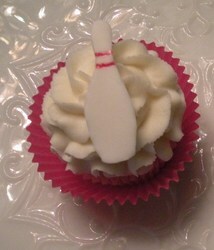 Some of the cupcakes will have bowling themed decorations on them. 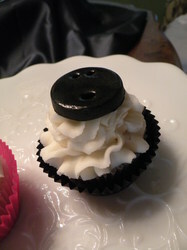 Here are some pictures of the first prototypes. For the display, I'll probably put pictures of us in the bowling alley... from the engagement shoot for sure, and maybe some snapshots too. I might put my bowling ball up too... I dunno.